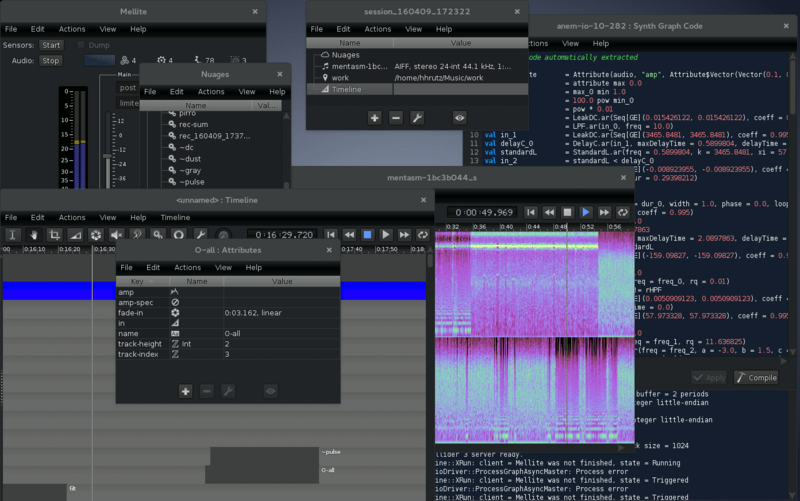 Mellite is an environment for creating experimental computer-based music and sound art. This system has been developed since 2012 by its author, Hanns Holger Rutz, and is made available under the GNU Affero General Public License. A binary version, ready to run, can be downloaded on archive.org or GitHub releases. Mellite is cross-platform, it is provided through a universal zip archive that can run on any platform including Mac and Windows, and a .deb package suitable for Linux Debian and Ubuntu. If you want to build from the source code, go to git.iem.at/sciss/Mellite. See below for additional requirements (Java, SuperCollider). On Mac, you need to allow the system to launch Mellite the first time you download it. Extract the zip archive, and go into the bin directory. Right-click (or Ctrl-click) on the mellite program, then choose Open. The computer will now warn you that the program is not verified, you have to confirm that you really want to open it. A terminal window should then pop up and soon after the Mellite main window should be opened. If this is not the case, you might be using a too old Java version (or not have Java installed at all). You can verify this by opening the terminal application (in the /Applications/Utilities directory) and executing java -version from the text prompt. You need version 8 or newer. See below for more information. Legal disclaimer: Mellite contains libraries also released under the GNU AGPL and GPL. You are entitled to the source code of all these libraries. The licenses of all libraries are available here. To obtain the source code, clone the source code repository of Mellite (see above), and in the file build.sbt add the qualification withSources() to any library before running sbt update. For example, to receive the source code of the PDFlitz library used by Mellite, change "de.sciss" %% "pdflitz" % pdflitzVersion to "de.sciss" %% "pdflitz" % pdflitzVersion withSources(). The sources will be downloaded to ~/.ivy2/cache/de.sciss/pdflitz_2.12/srcs. If you have trouble obtaining the source code of incorporated libraries, I can send it to you via e-mail in compliance with the GNU AGPL. Java. The recommended version is 8, currently Java SE Development Kit 8u201. If using OpenJDK, you may also have to install OpenJFX, since the API browser uses JavaFX. In some Linux systems (Debian, Ubuntu), you can use sudo apt install openjdk-8-jdk and sudo apt install openjfx to do so. On Raspbian, use Oracle JDK instead because of stability issues. We have now tested Mellite with JDK 11; it does not provide an installable package for JavaFX, which means the API browser does not work, and we still recommend JDK 8. However, you should be fine to run Mellite under JDK 11, if you do not need the API browser. The API docs can be found here, however the website is very slow. The recommended way to browse the API is from within the application itself, using the menu item Help > API Documentation. The best way to ask questions, no matter if newbie or expert, is to use the Gitter Channel. You need a GitLab, GitHub or Twitter account to sign in.